"Orange" in my culture means auspicious, lucky~! I think it's perfect in Christmas~!! Merry Christmas to you, you always bring so great photo and vision to all of us~!!! Hope you have the best Christmas holiday~! Merry Christmas, Cindy! I haven't been on the computer for a couple of days, so I am just catching up on everything. It's great to see how well Skate is doing! You can see that she now has that sparkle in her eyes:) I have read the previous post and comments and if you don't mind me saying, I think Skate has already chosen her family. Clearly she is one special little kitten; to live after what she has been through, to be taken in by such wonderful people and being treated like she has never known before. I'm not sure it would be the easier option (emotionally) for you to let her go to a new home. I don't want to be patronising, but you already know what is involved with a kitty leaving to go to a new home and from what we can see on the "Skate Updates", it sounds and looks like you have secretly made your mind up but have the "should I, shouldn't I?" thought. My cat, Tia, had me all to herself for 5 years before Rani came along (who is now almost 2 years old) and when I decided to keep Rani, Tia hated it. But now she tolerates Rani and the rest of the cats are fine with her. Up until earlier this year, I couldn't help thinking, "did I make the best decision to keep Rani?" Then I realised, it was the best decision and she now follows me around everywhere I go and cries if I'm not in her sight, she drives me up the wall with her naughtiness and is currently teaching Kimmie (the newest addition) all of her bad habits... and I love every single part of her! I can't even imagine my life without her now and there are no regrets. Aaw, I'm getting all teary now! Obviously it is a decision for you and the family and it is a particularly hard to decision to make, so I wish you all the luck in the world. What a lovely Christmas story Cindy. Merry Christmas to you and Brent and to all the sweet kittycats at Rosehaven Cottage! 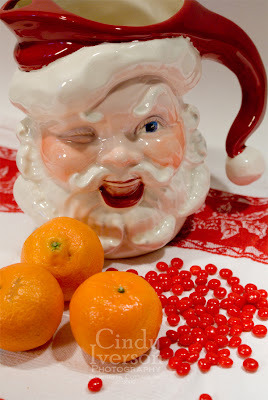 There was always an orange in our Christmas stockings too. That still brings back wonderful memories. Thanks for sharing yours. Same here - but it was a tangerine!